This set was masterminded by our 2nd Kickstarter Backers. Many of you requested a set that was made from various woods representing each color of the rainbow. Well here it is. For Red we have Bloodwood. For Orange we have Chakte Viga. For Green we have Lignum Vitae. For Yellow we have Yellow Heart. For Blue we have Blue Mahoe. For Indigo we have Rainbow Poplar. And for Violet we have Purple Heart. All contained in a compartmentalized American Holly Dice Box. These are really fun, but they sold before I could see your asking price. Could you say what you charged, and whether or not you would make similar sets and boxes? these were $150 for the set. I would absolutely pay $150 for this set. Please, please make more! I need it to teach color theory while I game! I have a confirmation, but it’s still in my cart. I know not what this means. Is shipping not supposed to be free? I was not charged for shipping when I purchased my set. I was. Are you in the US? Yes, I’m in the USA. International shipping maybe isn’t covered? I thought the prices always included shipping to the US. Shipping is free for the holidays. Other than that, I have no idea. Do you have plans to add Yellow Heart to the website to purchase on its own? yup enter yellow heart in the search box on the right and you should find the entry for it. I just did the search and did not find it. Nor can I recall seeing it in the directory when I last browsed. ah crap john you are correct. for some reason it has gone awol. i’ll get it back up tomorrow. I still dont find Yellow Heart when I search the site. Was it taken down? 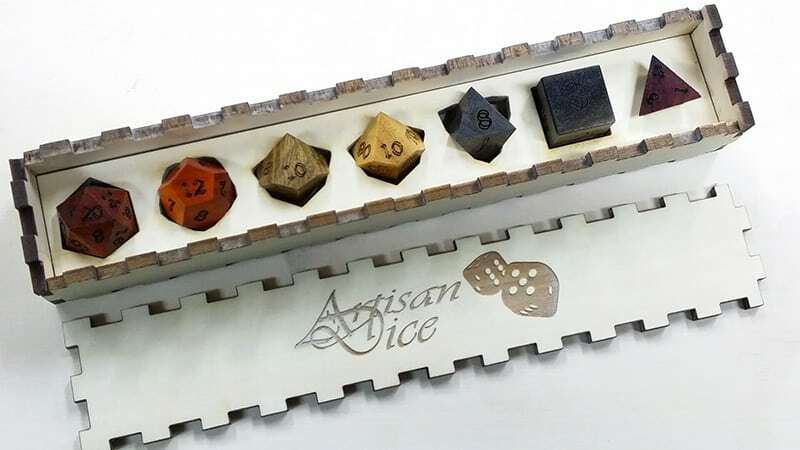 @Artisan Dice: Here you have this lovely sampler pack, and yet two of the woods are not available to order in dice sets (the Yellow Heart and Rainbow Poplar). Maybe you could get those two woods made available just in case someone who gets ROYGBIV decides they really love (Yellow Heart or Rainbow Poplar). I ordered this set on April 27, and sent an email to check on delivery… getting excited to give this as a gift… any updates? Thanks! we got a bit behind on shipping these. we had a couple of orders get missed yours was one of them. they will all go out this saturday. I came across these on your Facebook and would love to know when they might be available again.